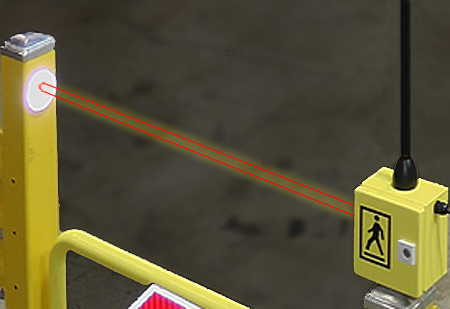 AisleAlert™ 2 Post Set, 4" x 4"
The technology used in the AisleAlert® allows detection of pedestrians by generating a light beam across an area such as a crosswalk entrance or hallway. The light beam bounces off a reflective target at the outermost point of the detection range and returns to the photo eye. As long as the light beam is not interrupted, the system stays in a neutral mode. However, when the light beam is broken by an object passing through it, controls in the system trigger an LED strobe light to flash for a pre-determined amount of time before resuming its neutral state. The light will continue to flash as long as the photo eye beam is interrupted. 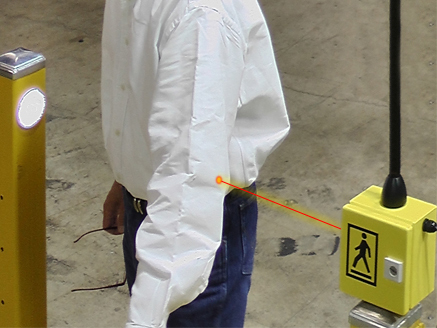 Through the use of this technology, you are able to monitor pedestrian crosswalks and warehouse pedestrian entry points, and automatically alert forklift operators to the presence of pedestrians in the traffic lane when they see the strobe light on the AisleAlert flashing. This system does not stop pedestrians or forklifts, it only makes drivers more aware. Pedestrians should always check both right and left to be sure there is no oncoming forklift traffic before entering traffic lane.